You could be forgiven for thinking that after adopting nine children over the past 27 years, Sue Clifford has seen it all in terms of training for working with vulnerable young people who have experienced abuse and trauma. But she had never tried virtual reality (VR) until a new Restorative Caring pilot by the Cornerstone Project was launched. The pilot programme, currently in its first wave of partnerships, puts adopters like Sue and foster carers and social workers in the mind of a child as they experience abuse and neglect. The case scenarios differ from a child being yelled at in a rundown living room, to a child in the womb living with domestic abuse and scenarios for how a foster carer can successfully support a child. As well as seeing the scenarios play out, the VR experience allows you to see how a child’s brain is reacting to the events they are witnessing. Clifford, despite nearly three decades of experience, found the experience “shocking”. She says she found the experience invaluable when going forward with her children. Dena Charles, a senior practitioner at Bracknell Forest’s Family Placement Team says the experience was “extremely emotive” and allowed her to be immersed in the child’s environment. Jeanette Crotch, a foster carer for the past three-and-a-half-years who has cared for 15 children, shares similar sentiments of the training. She says in one of the VR experiences, which involves an adult man yelling at the child, “a lot of us in the room were trying to pull away, that’s how realistic it felt”. Clifford says the understanding it gave her of a child’s experience would have made her more prepared throughout the time she has spent adopting, and would do the same for others. 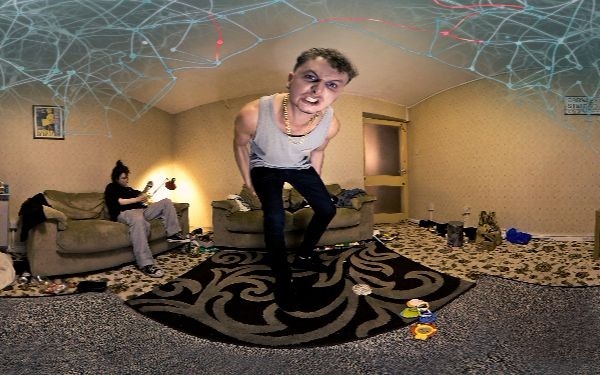 Would you be able to explain who designed this virtual reality – How adopted children or children in care or families were involved please? I’m keen to understand whose reality this portrays. Words like ‘run-down’ make me nervous – they imply a ‘class -divide’ around income hence my question. It is a good question londonboy. Too easy to stereotype families in difficulties and minimise the complex emotions of children within them. Perhaps this training could be used more with families to help them see their children’s perspective?? There is a place for materials like these if they are produced to explain one persons reality to another and the work is carried out ethically / by independent academics. Wonder how many of these LAs have endorsed these materials and are happy putting their name to this? virtual reality in the womb and so on? – and we are told this is in children’s and families interests? I think not. Thank you for your comments. The films have been produced independently by us (The Cornerstone Partnership) in consultation with children in care and who have been through the care system, adopters, foster carers, therapists, DDP specialists, clinical experts, directors of children services, social workers and directors expert in the field of filming in 360. The library of films are not for general release but are part of a carefully constructed pilot programme that is being independently tested and evaluated. The films are part of our training into Restorative Care. Feel free to get in touch if you would like to arrange a meeting to view the films and see how it can be used to support any work with families in the care system. 01628 636376. This material portrays a very ugly picture that all parents of children who enter Care are neglectful and abusive. Nowhere was the point made that children enter Care for lots of reasons often to do with poverty and or illness and the lack of resources to address these. I spoke to the chair of an adopters and special guardianship group about this film in the interim. She was pretty horrified and would have preferred a film that showed the results of abuse and its impact on a child and family as this is verifiable unlike “virtual reality”. Her main point was false narratives create distrust and this is bad for children. I’d go so far as to say if a film was produced like this about any other group it would be a hate crime. Hello, happy to talk further about this and our mission if you would like to contact me directly at rebecca@thecornerstonepartnership.com or call 01628 636376.